Get hyped for tonight's Suns-Kings matchup with this lookback at top plays from their recent games. Frank Mason drives to the rim and dishes a wrap-around pass to Kosta Koufos for the layup. Kosta Koufos kicks it out to Vince Carter for the three-pointer. Donovan Mitchell Scores 28 Points and Rudy Gobert adds 22 as the Jazz Defeat the Kings 103-97. Paul George drops 21 points, six rebounds, and 6 assists as the Thunder overpower the Sacramento Kings, 106-101. Russell Westbrook notches another triple-double with 17 points, 10 rebounds, and 11 assists. De'Aaron Fox throws the ball to Kosto and he slams it in. Nikola Jokic records another triple-double, this time with 20 points, 11 rebounds, and 10 assists in the Nuggets 130-104 win over the Kings. Buddy Hield scored 18 points off the bench for Sacramento in the loss. 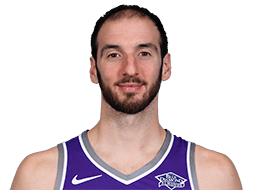 Kosta Koufos had a season-high 18 points and 13 rebounds, Garrett Temple scored 23 points and the Sacramento Kings beat the Orlando Magic, 94-88. Bogdan Bogdanovic leads the Kings to a 102-99 victory with 22 points and seven assists. Donovan Mitchell scores 27 points and Rudy Gobert adds a double-double (16 points, 12 rebounds) as the Jazz get a road victory over the Kings, 98-91. De'Aaron Fox throws an alley-oop to Kosta Koufos and Koufos finishes with a two-handed jam. Karl-Anthony Towns leads all scoring with 29 points to lead the Timberwolves to a win over the Kings, 111-106. De'Aaron Fox with the nice bounce pass to Kosta Koufos for the floater. Bogdan Bogdanovic with the behind-the-back pass to Kosta Koufos for the floater. George Hill puts David Nwaba on skates before dishing it to Kostas Koufos for the lay-in. Averaged 6.6 ppg (.551 FG%, 0-1 3pt, .613 FT%), 5.7 rpg, 0.7 apg, 0.5 spg, 0.7 spg, and 20.0 mpg in 71 games (62 starts) ... As a starter, averaged 6.6 ppg (.542 FG%, 0-1 3pt, .620 FT%), 5.76 rpg, 0.7 apg, 0.5 spg, 0.6 bpg, and 20.3 mpg in 62 games ... As a reserve, averaged 6.9 ppg (.622 FG%, .600 FT%), 6.0 rpg, 0.3 apg, 0.6 spg, 0.9 bpg, and 17.6 mpg in nine games ... Missed 11 games ... Did not play in 11 games due to rest (3/13, 3/22, 3/26, 3/29-4/12/17) ... Scored in double-figures 19 times ... Recorded 10+ rebounds in nine games ... Collected four double-doubles ... Led the team in scoring once and rebounding 13 times ... Top SingleGame Performances: Dished out three assists to tie his career-high along with eight points (4-7 FG) and seven rebounds vs. San Antonio (10/27/17) ... Posted double-figure scoring with 13 points (6-8 FG, 1-2 FT) for the first time of the season to go along with six rebounds in a win vs. Toronto (11/06/16) ... Scored nine points (4-7 FG, 1-1 FT) and recorded 10 rebounds in a win vs. Oklahoma City (11/23/16) ... Collected a season-high 13 rebounds and added 16 points (7-11 FG, 2-6 FT) and three blocks in 22 minutes of play to secure his first double-double of the season in a win at Memphis (12/16/16) ... Scored a season-high 18 points (8-9 FG, 2-3 FT) and added five rebounds in a win at Denver (1/3/17) ... Tied for a team-high 14 points (6-8 FG, 2-2 FT) and grabbed 11 boards for his second double-double of the season vs. Minnesota (2/27/17).